Samuel Wale (1721?-1786) was an English painter, who often worked with the British engraver Charles Grignion the Elder (1721–1810). Both men sought steady employment from booksellers. 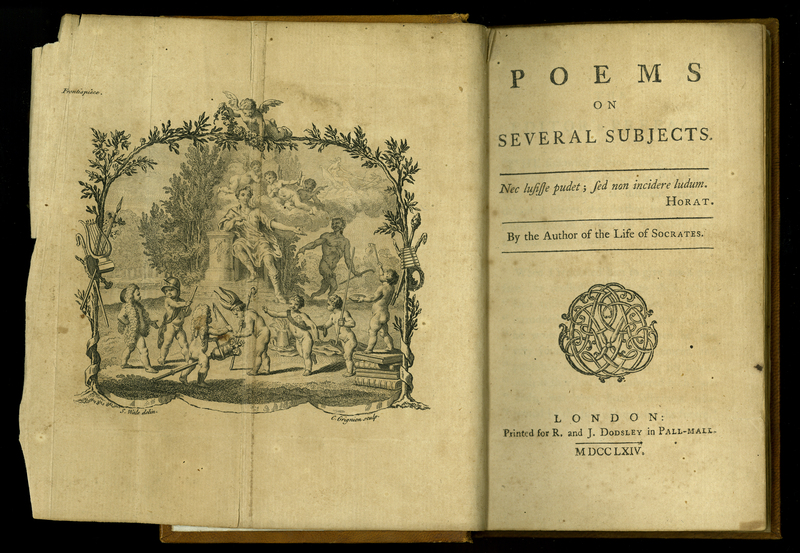 Perhaps to enliven John Gilbert Cooper’s rather dull title, Poems on Several Occasions (1764), publisher Dodsley asked Wale to concoct the bacchanalian scene that forms this foldout frontispiece. The vignette was certainly typical of Wale’s work. Importantly, the frontispiece has been so termed on the foldout image, and is in the position with which most modern day readers are familiar: on the left. [John Gilbert Cooper], “Poems on Several Subjects,” ourheritage.ac.nz | OUR Heritage, accessed April 20, 2019, http://ourheritage.ac.nz/items/show/10651.